David Attenborough has called Captain Cook “the greatest seagoing explorer of all time”. Picture courtesy of Creative Commons. Cook died in Hawaii in 1779 after a scuffle with the locals. Painting by George Carter, image courtesy of Creative Commons. Australian artist Daniel Boyd’s revised version of Fox’s classic painting, We Call Them Pirates Out Here. Picture courtesy of the British Library Board. 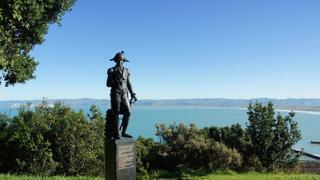 A statue of Captain Cook on Titirangi Hill in New Zealand. Picture courtesy of Creative Commons. David Attenborough has called him “the greatest seagoing explorer of all time”. His 18th century voyages allowed the southern hemisphere, and tracts of the Pacific Ocean, to be painted on to European maps. 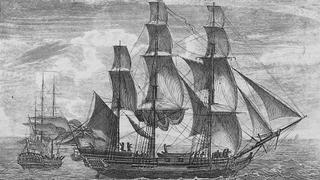 James Cook set sail on Endeavour, a Whitby-built collier, on 26 August 1768. As historian Peter Moore writes in his new book, Endeavour, “there had never been a ship like her in the Royal Navy before. With the most commonplace of attributes, she would go on to become the most significant ship in the history of British exploration.” There were 94 people aboard, “including Officers Seamen Gentlemen and their Servants”, as Cook wrote in his journal. She carried provisions for 18 months. It was the beginning of one of humankind’s greatest adventures. Cook’s three voyages of discovery ended in 1779, when he was killed in a confrontation with some indigenous inhabitants of Hawaii. Commemorating his achievements in the 21st century is complex. 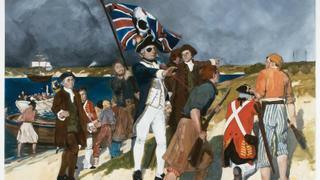 One of the most famous depictions of him is E Phillips Fox’s 1902 painting, Landing of Captain Cook at Botany Bay, 1770 – an image of the “founding” of colonial Australia, in which Cook stands front and centre, arm outstretched as if blessing the land. It was reproduced in the catalogue of the British Library’s recent exhibition, James Cook: The Voyages; but on the next page another painting appears. By Daniel Boyd, an Australian artist of Aboriginal heritage, the 2006 canvas We Call Them Pirates Out Here reworks Fox’s painting: a skull is superimposed on the Union flag and Cook wears a black eyepatch. Cook’s accomplishments with carefully revised perspectives on them. But there is no denying Cook’s voyages were central in opening up the world. From Tierra del Fuego to New Zealand, Tahiti to Easter Island, the north Pacific to Hawaii – Cook and his men demonstrated that trade and travel were possible at any distance. And thanks to the remarkable artists who travelled with him – Alexander Buchan, Sydney Parkinson and William Hodges, who made the first known oil painting of the Antarctic continent – Europeans were given astonishing insight into all that Cook had seen and, in the parlance of the day, “discovered”. But one man’s discovery is another’s conquest. Cook had been ordered “to take possession of Convenient Situations in the Country in the name of the King of Great Britain”. That “possession” has had a lasting legacy. There is, however, more than one way to mark an anniversary. Oceania, which opened at London’s Royal Academy in September, brings together hundreds of works, spanning more than 500 years – from shell, greenstone and ceramic ornaments to canoes and house façades: a vibrant display of the sophisticated cultures Cook encountered on his travels. And in 2019, a national commemoration is planned in New Zealand. Tuia Encounters 250 will mark the first meetings between Māori and Europeans. Cook’s map of New Zealand is on display at the British Library – it remains remarkable for its accuracy. “Ambition leads me not only farther than any other man has been before me, but as far as I think it is possible for man to go,” Cook wrote in his journal in January 1774, only a few days after his ship crossed the Antarctic Circle for the third time. He would be proved wrong – but only after centuries had passed, when humans finally hurtled out of the atmosphere, heading for the Moon. Endeavour: The Ship and the Attitude that Changed the World, by Peter Moore, £20, amazon.co.uk;Oceania, 29 September to 10 December, royalacademy.org.uk;jamescook250.org.